The ESPN college basketball analyst believes the No. 9 pick needs to be a player that franchise star Kristaps Porzingis will get excited about. As Kristaps Porzingis continues his rehab from a torn ACL, the Knicks are in the process of choosing a main piece to put alongside their franchise player. All signs point to the Knicks taking a forward with the No. 9 pick in Thursday’s NBA Draft. The forward position is an area of need for the Knicks and a strength in this draft. Villanova’s Mikal Bridges, Duke’s Wendell Carter Jr., Missouri’s Michael Porter Jr. and Kentucky’s Kevin Knox are players on the Knicks’ radar. Depending on how the draft plays out, Bridges and Knox might be the only two available when the Knicks pick. If so, they would have to decide whether to go for the more ready, polished player in Bridges or the 18-year-old Knox, who could blossom into a really good pro. ESPN college basketball analyst Seth Greenberg believes Bridges and Knox would fit nicely with the Knicks. But Greenberg, a Plainview native and Plainview-Old Bethpage JFK graduate, said everything the Knicks do has to be with Porzingis in mind. The Knicks, who have missed the playoffs the past five seasons, are rebuilding. President Steve Mills and general manager Scott Perry repeatedly have said they will do it the right way and not go for the sort of quick fix that has hurt the franchise in the past. The Knicks plan to build around Porzingis and position themselves to be big spenders in the summer of 2019, when Kawhi Leonard, Kyrie Irving, Klay Thompson, Kemba Walker and Kevin Love could hit the market. That’s just another reason this is a huge pick as the Knicks look forward while building a team they hope can be a perennial contender in the near future. Bridges and Knox are versatile forwards, but Bridges, 21, is the better fit for the Knicks right now. 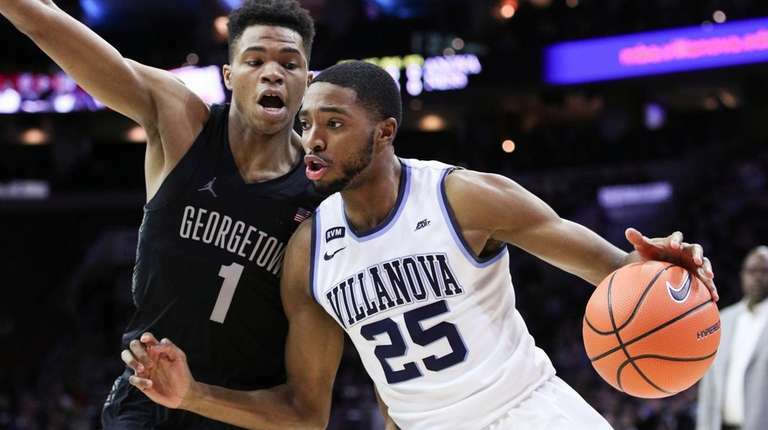 He spent four years at Villanova — one year as a redshirt freshman — so he’s more NBA- ready. Bridges is athletic, can guard multiple positions and is a good shooter. He’s the kind of hybrid forward the NBA has fallen in love with in recent years and should be able to slide right in and help the Knicks. He also comes from a winning program. Bridges helped Villanova win two NCAA championships. Knox also has been coached well; Kentucky coach John Calipari runs an NBA factory. Knox improved his offensive game throughout his freshman season and matured. Many, including Greenberg, think he will continue to rise and might be worth the wait. “I love Bridges, but he’s got holes in his game,” Greenberg said. “Greatest kid. Good off-ball defender. Good anticipation. Not as good on the ball. Can he make shots? Where’s his upside compared to Knox’s? This undoubtedly will be something the Knicks’ decision-makers will weigh. There are wild cards who will impact the Knicks. Porter’s talent is undeniable, but his health concerns could affect where he goes. He was considered a top-three pick before he needed back surgery as a freshman. He also had hip issues this spring. The other wild cards are Alabama’s Collin Sexton and Oklahoma’s Trae Young, who are guards. Both could go in the top eight, with Orlando (six) and Cleveland (eight) possible landing spots, but one or both could be there when the Knicks pick. If so, the Knicks may have a little debate — more so for Sexton. A better scenario for the Knicks would be if Sexton and Young are taken before they pick. It would mean at least three of the forwards they’re considering would be there. Carter is a skilled bigger forward who could go fifth to the Mavericks or seventh to the Bulls. Greenberg doesn’t think he will fall to nine. Perry, overseeing his first draft as a lead executive, could try to trade up for him.